Good seals require not only enough heat to melt a bag together, but also enough cooling time to allow the seal to set. Our most common complaint is that a sealer is not creating a good seal and 99% of the time, the operator is not holding the arm down long enough to allow the seal to cool and set. 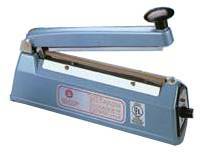 Manual impulse sealers such as your hand or foot sealer require a congeal or dwell step to create a proper seal on your bag or film. To achieve the best seal, hold the arm or upper jaw of your sealer down for an additional 2-4 seconds after the signal light has turned off to allow the seal to cool and set. Follow our simple instructions below and you will get great looking seals! 1) Set the timer at 3 and place your bag on the seal surface. 2) Bring the upper jaw and seal arm down on the bag and hold in place until the timer light goes out and continue to hold the upper jaw or seal arm down for an additional 2-4 seconds to set or congeal the seal. 3) Lift the upper jaw or seal arm; test the bag or film. If the seal is strong, the timer setting is correct. Increase or decrease the timer setting slightly and test again until you achieve the perfect seal. **Higher timer settings and thicker materials require longer congeal times. **Following the above instructions will lengthen the life of all the parts. This entry was posted in Foot Sealer, Hand Sealer, Instruction, Troubleshooting and tagged Hand Sealer, Impulse Sealers, Instruction, Sealer Sales. Bookmark the permalink.